Definition at line 22 of file Filler.h. Definition at line 20 of file Filler.cc. Definition at line 30 of file Filler.cc. References action, debugs, Mgr::StoreToCommWriter::entry, HERE(), Must, NULL, requestId, and Mgr::StoreToCommWriter::start(). Definition at line 41 of file Filler.cc. 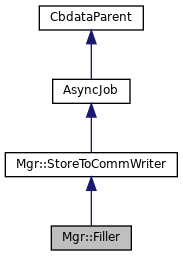 References action, debugs, HERE(), requestId, and Mgr::StoreToCommWriter::swanSong(). Definition at line 35 of file Filler.h. Referenced by Filler(), start(), and swanSong(). Referenced by Mgr::StoreToCommWriter::doneAll(), Mgr::StoreToCommWriter::scheduleStoreCopy(), start(), Mgr::ActionWriter::start(), Mgr::StoreToCommWriter::start(), Mgr::StoreToCommWriter::swanSong(), and Mgr::StoreToCommWriter::~StoreToCommWriter(). Definition at line 36 of file Filler.h. Referenced by start(), and swanSong().